You are at:Home»Immigration Issues»Asylum & Refugees»Refugees Coming to a Town Near You? Refugees Coming to a Town Near You? Even as American citizens are concerned about refugees and illegal aliens surging across the border, our country’s top intelligence officials have admitted that they have no way of properly screening refugees from Syria. As a result, President Obama’s announcement to resettle upwards of 10,000 refugees from that country this fiscal year has left many searching for more information about the refugee resettlement process in their state. The President has increased the number of refugees the U.S. accepts to 85,000 in FY2016 and 100,000 in FY2017. 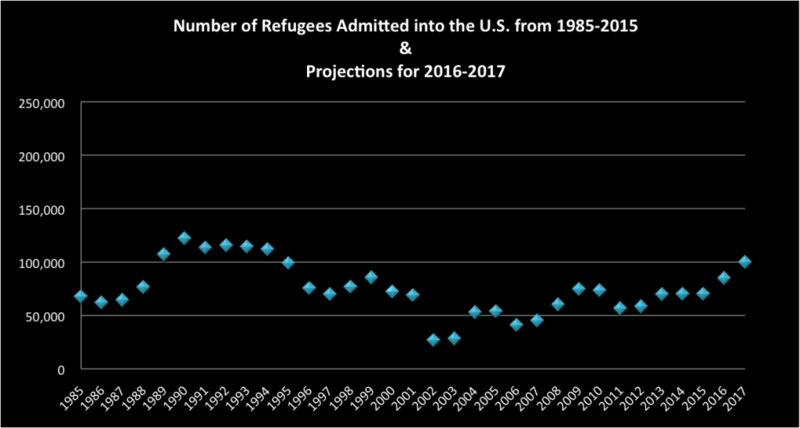 Given that the number of refugees admitted to the U.S. has remained at around 70,000 for the last three fiscal years, this growth would increase the number of refugees coming into the U.S. by 45,000 over the next two years. The chart below represents the number of refugees admitted into the U.S. from 1980 through the projected amounts in 2016 & 2017. Source: U.S. Department of State, Office of Admissions, “Refugee Admissions by Region 1975-2015,” various years. On Friday, two Iraqi refugees were charged in court for terror-related activities. Terrorist organizations, like ISIS, have stated their intention to use the refugee crisis to infiltrate Western countries. Primarily, American citizens have been concerned with the President’s announcement to bring in 10,000 Syrian refugees, but what about the rest of the illegal immigrant population and refugees alike? Based on the proposed FY 2016 cap set for 85,000, an additional10,000 Syrian refugees would only account for approximately 11% of all refugees for the year 2016. That still leaves 89% of the refugee population. 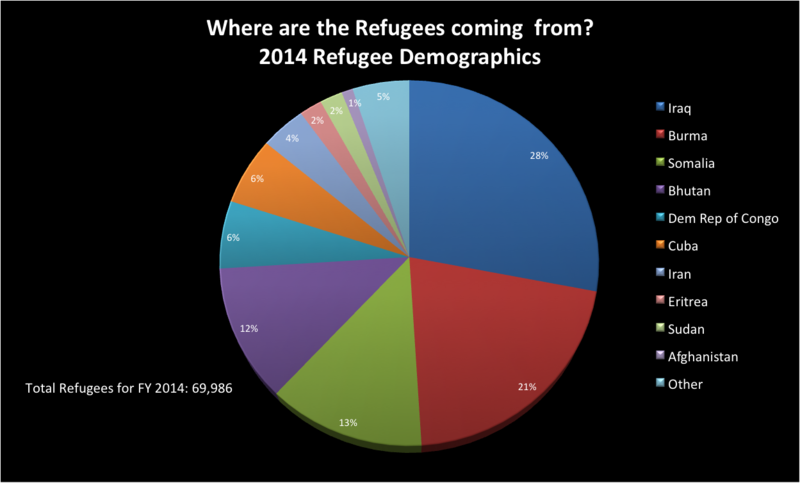 The latest data from Fiscal Year 2014 gives some valuable insight regarding the demographics of refugees. In 2014, refugees were admitted to the United States from 78 different countries. The top 10 refugee countries account for 95% of all refugee admissions into the United States. These include: Iraq, Burma, Somalia, Bhutan, Democratic Republic of Congo (DRC), Cuba, Iran, Eritrea, Sudan, and Afghanistan. The remaining 5% of refugees denoted as “Other” represent the total refugees from 68 countries combined. Below is a chart depicting the percentage of refugees from each of those countries. Source: Office of Refugee Resettlement, “Refugee Arrival Data, FY 2014 Refugee Arrivals,” 2014. In 2014, Business Insider issued a report on the World’s 25 Most Failed States. Interestingly enough, six out of the top ten countries the United States received refugees from are listed as failed states in report: Burma, Eritrea, Iraq, Afghanistan, Democratic Republic of Congo, and Somalia. Where do refugees go once they are sent to the U.S.? How much say, if any, do states and localities have during the resettlement process? Who will pay for it? These are all questions that individuals are—and should be—asking. Shedding a little more light on the process, last December, the Department of State issued its Refugee Processing Center Affiliate Directory. The directory contains the locations of 293 Refugee Processing Centers across the nation. As always, FAIR encourages its members to get involved and ask their state legislators what they are doing to evaluate their states’ refugee arrivals policy to ensure proper screening for potential public safety and national security concerns. For more information about the states’ role in the resettlement process, you can view FAIR’s report: The Role of States in the Refugee Resettlement Process, which informs state activists and representatives steps they can take before, during, and after refugee arrivals to your state. Next Article One Million Illegal Aliens on the Road in 2016? Have any of the people in our government responsible for these policies thought about the fact that if we continue to bring huge numbers of people from failed states into our country, that at some point out in the future we could also end up a failed state, or at best another Brazil or Argentina? “Who will pay for it?” The taxpayers, for years and years. All of these people end up on public assistance of some kind at very high rates. Does Obama hate America that bad?